If so many people have Acid Reflux, why is it so hard to diagnose? Well that’s a good question! Often times what you think might be Chest Pain or a Bitter Taste in your mouth is actually Acid Reflux. But make no mistake, its serious stuff. Heartburn if left untreated can lead to Barrett’s Esophagus which is a precursor to cancer. The following is a list of symptoms that may indicate you have an Acid Reflux issue. Do you ever experience Hoarseness just out of the blue? You haven’t been screaming at a loud concert or anything like that, just all of a sudden your voice is hoarse. Well if you have stomach acid getting past your lower esophageal sphincter, it can irritate your vocal chords. This is where hoarseness comes from. Just like hoarseness, a sore throat is another symptom that may not seem related. We all know what a sore throat feels like from having the cold or flu. However, if you are not sick and you still have a sore throat, this symptom that might actually be caused by digestive problems. 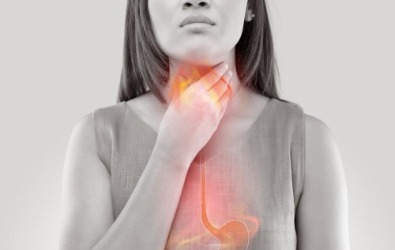 If you have Reflux and the content from your stomach is backing up through your Lower Esophageal Sphincter then into your esophagus, this can cause a “non-cold” related sore throat. Try some Aloe juice to reduce the inflammation. Do you have a chronic cough that just won’t go away? Do you always feel like you have to cough all the time but you are not sick? This may be related to Acid Reflux which is likely caused by stomach acid getting into your lungs. When you go to sleep, this is heartburn’s most exciting time! When lying flat on your bed, that pesky gravity can’t keep stomach acid where it belongs (in your stomach). Think of your stomach and your esophagus as a water bottle. When the bottle is upright, the water is really not going to find its way to the top of the bottle on its own. But when you tip the bottle horizontally, gravity kicks in and the contents of the bottle easily flow out the top. Same thing happens when you are sleeping on a flat bed. In this case its stomach acid, wreaking havoc on your esophagus.This is why it is recommend for people with chronic heartburn to raise the head of their bed 6-8 inches. If you get pain in your mid-section right after eating a big meal it probably means you have low acid, which means you have trouble digesting food normally. As a result the food has nowhere to go and just backs up into your esophagus. In fact, people with really low digestion can feel extremely full after eating a normal size meal. If you find this is you, you might consider a digestive enzyme to help relieve some of these symptoms. Chest pain is a common complaint, especially among those that don’t realize they have acid reflux. Often times when someone finds out they have acid reflux, it’s the result of a trip to the ER for chest pain. This type of chest pain can mimic heart issues and become really scary. Well, that’s acid! Sounds horrible and it really is, but when the contents of your stomach back up through your esophagus to the point where you can taste it, it’s not pleasant. A simple quick fix when this happens is to drink something sweet that is non acidic. Coconut water, Apple Juice etc. You might also want to try Aloe Juice once this happens to help reduce the inflammation of the burn. People with Acid Reflux often complain of trouble swallowing. A tightness in the throat combined with shallow breathing. It’s hard to break this cycle, but using diaphragmatic breathing can help relieve stress and reduce the trouble swallowing sensation. If you experience any of these symptoms, you might have Acid Reflux, also known as Heartburn or GERD. There are a variety of simple home remedies that can help with each of these symptoms, however as with any medical advice, it is always a good idea to check with your medical professional.